Stone Mills Township will decide whether transmission lines for the Loyalist Solar Project installed on County Rd. 27 are above or below ground, Lennox and Addington County council has decided. At Wednesday’s working session councillors approved a motion to execute a roads use agreement with the project’s developer BluEarth Renewables excluding Schedule F of the document, which detailed the proposed lines connecting the project to the power grid. Councillor John Wise asked his colleagues to respect that it is a local issue. “Stone Mills has been negotiating with BluEath on its Loyalist Solar Project transmission route for some time and we’re getting down to sort of the final negotiations. The community has spoken quite clearly that they don’t want to look at industrial-type utility polls on roads that have never had any sort of utility polls,” Wise said, explaining township council moved a request that all lines be buried at its meeting Monday evening, negating Schedule F as presented. Wise said Stone Mills Township was told County staff did not have any preference for the lines to be above ground on poles or buried in trenches. Roads and bridges manager Chris Wagar supported that statement. Loyalist councillor Ric Bresee asked chief administrative officer Brenda Orchard if she had any concern with the County adopting a contractual agreement with a proviso that allows another entity to dictate one component. She indicated she didn’t. Greater Napanee’s Gord Schermerhorn said he had concern about burying the cable because of his own experiences trying to create entranceways to his property on a County road where he had to locate an Internet cable running in a County ditch along the road to proceed. Warden Bill Lowry said he wasn’t so concerned about private individuals as much as what would happen if the County had to do work along County Rd. 27 in the years to come that might impact the lines. Again, Wagar stated he was confident it wouldn’t be an issue due to the location of the trenches and a rather generous right-of-way that allows the county between 22-24 metres for an eight-meter wide road platform. In trying to understand the issue, Addington Highlands’ Helen Yanch asked what the lines and poles looked like. She was told they’re on 60-foot poles, which are taller than regular telephone polls. Wise shared his understanding the concern had more to do with location. Wise also said he understood there are plans for widening County Rd. 27 in the municipality’s roads plan that would see trees cut on both sides. Regardless of the method of transmission, he said the County would get one side of the road cut on BluEarth’s dime. 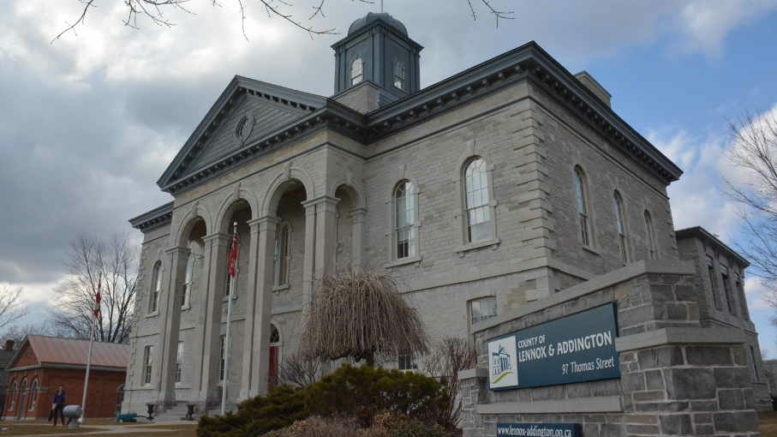 Greater Napanee councillor Marg Isbester said she supported Stone Mills in its efforts, particularly after learning hundreds of trees will be cut down in Murphy Road alone. “I have to applaud Stone Mills council for listening to your residents and going ahead with this,” she said.